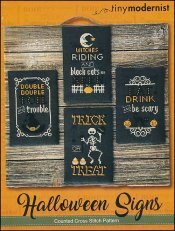 Halloween Signs [C6431] - $12.00 : Yarn Tree, Your wholesale source for cross stitch supplies. Cross stitch pattern from Tiny Modernist. Are you looking to add a little spooky to your door for Halloween? The "Halloween Signs," include four different designs. The first design reads, "When witches go riding and black cats are seen," with a moon stitched at the top & a fence with a pumpkin stitched at the bottom. Lookout for the black cat! "Eat drink and be scary," is stitched on the second design. Got bones? This skeleton does on the third design! "Trick or Treat," is stitched with a skeleton dancing a jig, holding onto his hat. Look who just came riding in on the fourth design...the "Double double toil and trouble!" Stitch count on each design is 42w x 69h. Stitched on #2845 Zweigart Belfast Linen 32ct. Charcoal.